Now that we plan on making a trip to Dallas, TX each year for the Texas Frightmare Weekend, we have also included to stop by Humperdink’s Restaurant for lunch and some beers during out stay up there. 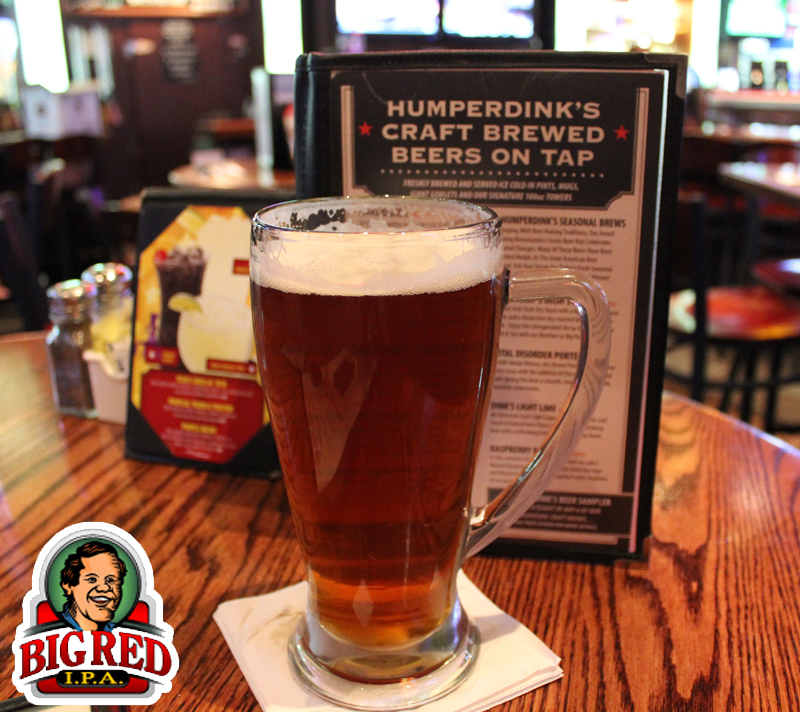 Humperdink’s is a restaurant, sports bar, brewpub chain which of curse is not down in San Antonio. They have a full food menu, and a full service bar, as well as a good list of in house beers, including Big Red IPA. In the restaurant, there is a big neon sign above the bar which says Big Horn Brewing Company, so I am assuming this is the company which supplies the restaurant chain with their said own micro-brewed beers. I am also going to mention that I believe in other parts of the country they have another chain restaurant under their belt known as RAM Restaurants, as they serve the same exact beers. Well, I just got off the phone with the Humperdink’s location at near the Six Flags Amusement Park, and the manager said at that particular location, they brew on site. Good to know! They still are the Big Horn Brewing beers/recipes. OK, let’s move on shall we. I did order a sampler flight of all their beers, but before I did that, I had actually ordered a single beer, which was a 22oz glass of Big Red IPA. The beer poured a nice slightly hazy dark copper color with a foamy off white head, which wasn’t very thick, but it kept great retention, leaving a good sticky film down the glass. Nice looking IPA for sure. Since they say this beer is moderately hopped, don’t expect to be blown away by hop aromas/flavors here. We have a nice well balanced beer. In the aroma, the hops are present with a floral hint, almost a bit danky on top of a caramel malt smell. Pretty basic here. Taste wise, again there is a good balance of flavors going on. There is a slight danky funk, floral hop taste that is right from the start all the way through to the aftertaste. I want to say, I picked up a bit of a pine note as well. The backbone of this is a caramel, toffee presence. Sweet taste with a slight bitter bite. Not your typical American IPA. Best way to describe it to you would be to say it is a nicely hopped brown ale at best. The mouthfeel was a bit thin with a decent carbonation. Even though it was a little thin, it did have a smoothness to it, making this beer easily drinkable. This beer is enjoyable for a restaurant chain beer. A perfect way to start off my visit, as it worked well as my appetizer before I got my meal. I know when I visit this restaurant again next year (or maybe before) I will get this one again. The Metal Connection was easy for me to choose. Big Red, Blood-Colored. They seem very similar to me. Plus, EDGE OF SANITY is one of my all time favorite bands, so i listen to them almost daily, especially this song. So please enjoy this Blood-Colored Big Red IPA! On the Edge of Sanity, BeerMetalDude!